We are approaching the final few fences and many artists have fallen, but surprisingly Take That are still up for grabs so I am nabbing ‘ Kidz’. It was a toss up between this and Shine – both with Mark Owen on lead vocals. It was released before the summer riots of 2011. 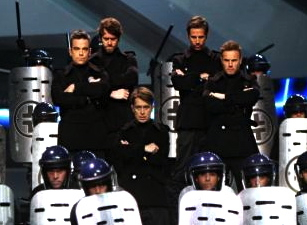 Performing it with dancers dressed in riot gear at the Brits that Spring clearly stirred the ‘Kidz’ to political action (as opposed to a desire to nab some wide screen tellies) – take that Public Enemy! You are a very sick man and need help; fortunately help is at hand. My number 2 is……. I certainly like parts of the Napalm Death track – the intro is quite good and the middle eight(h) owes a lot to Dave Gilmour. However towards the end it doesn’t really go anywhere so eventually grinds to a halt. Lacks the complexity and groove of ‘You Suffer’ but still a fine tune. I fully expect Richard’s number 1 to be ABBA but I’m hoping you’re going to hold out Andy ! Well I have no doubt that amongst our readers (I may be presumptive in assuming a plural actually) breathless speculation about our number ones will be even more exciting than what the Doctor’s name is. However at the risk of Spoilers, no, it’s not Abba and, as I go first, no one can stop me now (maniacal laugh). There’s eclecticism, then there’s just being silly. Everybody knows that the only ABBA song of any worth was this magnificent cover version by another (but very different) bunch of Swedes.